Lack of diversity in news and newsrooms continues to affect whose voices get heard and the ways in which stories are told. Two recent reports by the American Society of News Editors and the Women’s Media Center show that news organizations are still dominated by men and have little racial diversity. At the same time, online communities driven by people traditionally underrepresented in the media are helping to fill gaps by illuminating important topics, often ignored by mainstream media, and pushing journalists to reexamine their coverage. A recent Knight Foundation report, produced in collaboration with digital studio Postlight, examines these trends, revealing how subcultures on social media, specifically Black Twitter, Feminist Twitter and Asian-American Twitter, interact with reporters and the news. On March 26, Knight and Postlight will host an event to draw on the themes in the report. 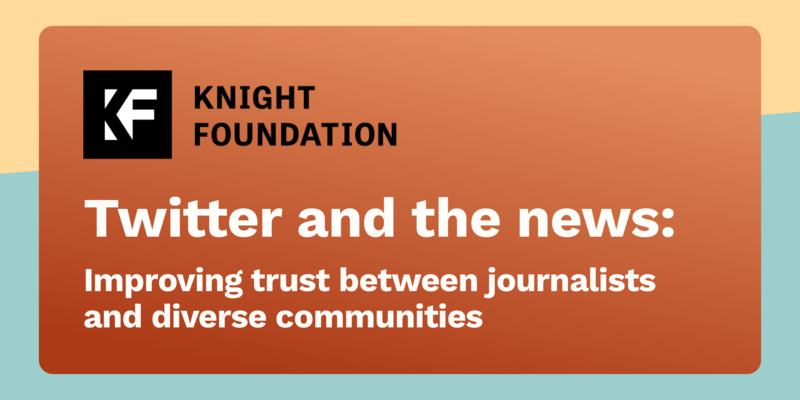 Join us for discussions with leading journalists, technologists and academics to explore ways to restore trust between the media and diverse communities. We’ll examine how reporters can work to repair relationships with these communities, and what social media subcultures might reveal to journalists about inclusive and authentic reporting. In addition, we’ll reflect on the role of online platforms in shaping how these communities interact with the news and reporters. The event will be streamed via Periscope on @knightfdn Twitter from 3 – 6 p.m. ET Monday, March 26. We encourage you to tune in and to participate, with the hashtag #twitterandnews. If you'll be in New York and would like to attend, please RSVP. Olivier Kamanda, director of learning and impact for Knight Foundation, and Paul Ford, co-founder and managing partner at Postlight, will introduce the report and platform "How Black Twitter and other social media communities interact with mainstream news." 3:15 - 4 p.m.: Repairing the Relationship: How can we create trust between media and diverse communities? How can the media tell richer, more diverse, more respectful stories? How can journalists report accurately on marginalized communities? Meredith D. Clark, assistant professor at the University of Virginia and researcher of "How Black Twitter and other social media communities interact with mainstream news"
4:15 - 5 p.m.: What Audiences Tell Us: Why are the most shared outlets also among the most criticized? How should we approach the broken feedback loop that encourages low-quality content? Deen Freelon, associate professor at the University of North Carolina and lead researcher of "How Black Twitter and other social media communities interact with mainstream news"
5:15 - 6 p.m.: The Role of Platforms: How do platforms create and encourage unproductive dynamics, and how might they develop in response to research? Anusha Alikhan is director of communications at Knight Foundation. Email her at [email protected] and follow her on Twitter @anushaa100.